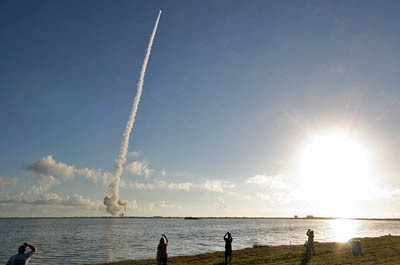 Upgrading the Global Positioning System one launch at a time, a modern bird soared to space Thursday to replace a long-surviving navigation satellite deployed 19 years ago, a durable craft of the past that doubled life's expectations and will give way to current advancements. Following an overnight countdown that saw United Launch Alliance load its Delta 4 with supercold liquid hydrogen and liquid oxygen rocket fuel at Cape Canaveral's Complex 37, clocks hit the targeted blastoff time at 8:10 a.m. EDT (1210 GMT). The pad's three swing arms pulled away as the 206-foot-tall, orange and white launcher thundered skyward atop 1.2 million pounds of thrust from its cryogenic main engine and twin strap-on solid motors. The rare morning launch was precisely timed to deliver the GPS 2F-3 satellite into the orbiting constellation three-and-a-half hours later. Performance measurements observed during the ascent, however, prompted whispers and wondering about the vehicle's upper stage throughout the morning. After a tense wait to hear official confirmation of the rocket's final maneuvering, deployment of the spacecraft and the ultimate outcome for the mission, word of success and a sigh of relief verified that the GPS satellite had arrived in the proper orbit. Telemetry obtained during the launch will be thoroughly analyzed in the rigorous post-flight review process, but ULA and its Air Force customer both stressed that the Delta's launch achieved the correct altitude for the payload to begin its 12-year mission life. "Congratulations to the entire team on today's successful launch of the GPS 2F-3 satellite," Jim Sponnick, ULA vice president for mission operations, said in the post-launch press release. It was only the third GPS replacement launch in the past three years, as the Air Force stewards manage the delicate balance of extracting the entire usefulness of existing spacecraft while introducing enhanced capabilities when the newest satellites go up. "One of the really great things about our GPS satellites is that they've consistently exceeded their design life. 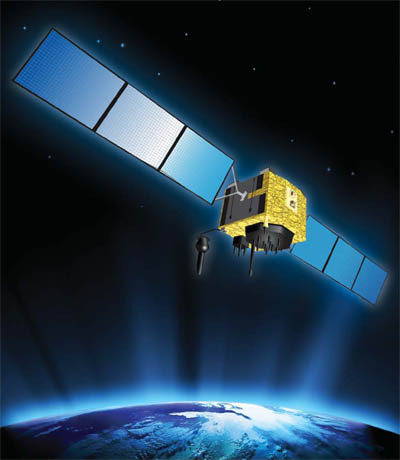 In fact, our oldest GPS 2A that's still operating on-orbit is actually of drinking age!" said Col. Steve R. Steiner, chief of the GPS Space Systems Division at the Air Force's Space and Missile Systems Center. A billion users around the globe rely on GPS every day, whether they know it or not. From the overt navigation assistance in transportation to the less obvious role in providing accurate timing stamps on banking transactions, the system developed to support U.S. military forces and their guided munitions has blossomed in the commercial marketplace. 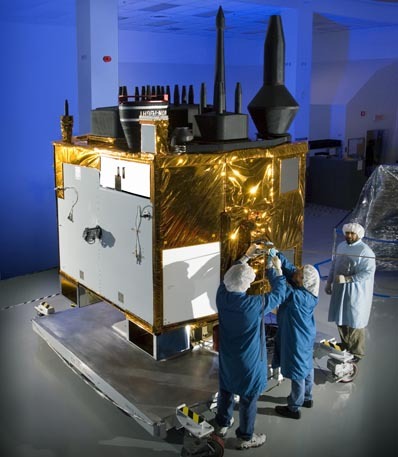 When the GPS 2F-3 satellite is checked out and becomes operational later this year, it will assume the role filled by the GPS 2A-21 spacecraft that has been in service since July 21, 1993. That old craft was deployed by a Delta 2 rocket from Cape Canaveral on June 26, 1993, during the heydays of launching GPS satellites at a fast and furious rate. 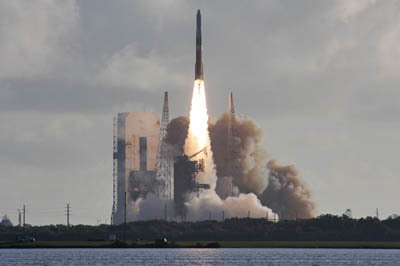 The bigger Delta 4 took over with the next-generation GPS satellite series in 2010 with the first of the Block 2F craft and followed that up with another success last year carrying 2F-2. The launch rate throttled back to meet the needs of the constellation, calling up rockets only when aging satellites needed replacing. But that tempo is expected to start picking up again. "We do expect to see an increase in the one-launch-per-year (rate) starting in the next year and beyond," Steiner said. But instead of waiting for in-space failures of aged satellites, the Air Force "does smart planning of launches to ensure we are resilient," Steiner added. "We plan (launches) based on reliability and how old the ones we have on-orbit are, so even if something hasn't failed yet, we do make plans to be resilient to any dips or drop outs." Projections show GPS 2F-4 launching next May aboard an Atlas 5 rocket and GPS 2F-5 following next November aboard another Delta 4 from Cape Canaveral. But the true needs of the constellation next year coupled with the availability of spots on the cramped military launch schedule will drive final scheduling. "This is an operational decision, based on the operational needs across the Department of Defense," Steiner said. Boeing has three more 2Fs already finished and waiting in storage for launch opportunities, three further birds that should finish construction by year's end and the final three that will complete assembly by next summer, according to Paul Rusnock, Boeing's vice president of government space systems. GPS satellites fly about 11,000 miles above the planet and emit continuous navigation signals that allow users to find their precise position in latitude, longitude and altitude and determine time. Populating the operational constellation began on Valentine's Day 1989. Today's GPS fleet is comprised of 31 satellites, including 10 Block 2A's made by Boeing, 12 Block 2R's and seven 2R-Modernized spacecraft built by Lockheed Martin, and Boeing's two Block 2F. The oldest still in operation is nearing its 22nd orbital birthday. "We do have a very robust constellation, but it is a mix of older and newer satellites," Steiner said. The Air Force is in the midst of further advancing the GPS network by deploying a new breed of satellite, produced by Boeing, that features improved accuracy, enhanced internal atomic clocks, better anti-jam resistance, a civil signal for commercial aviation, a longer design life and reprogrammable onboard processors to evolve with future needs. "The first two of these 12 GPS 2F satellites are on-orbit and are meeting all of our mission requirements. The atomic clocks on board are providing the best accuracies ever for the GPS constellation," Steiner said. Boeing is building the dozen Block 2F craft to form the constellation's foundation for the next 15 years. "With each GPS 2F launch and deployment, we are contributing to the sustainment and modernization of the network. It's a privilege and a thrill to be part of this absolutely critical global utility," said Jan Heide, Boeing's GPS program director. The space system features six orbital planes with multiple satellites flying in each. This latest sustainment craft will be maneuvered into Plane A, Slot 1 of the network, with the old bird currently in that position sliding aside to begin an auxiliary role within the A-Plane. The roots of GPS are firmly entrenched with the U.S. military, which developed the satellites to guide warfighter with unparalleled exactness. Nearly every piece of military equipment uses GPS' precision timing and navigation capabilities. "GPS continues to provide vital capabilities to our nation's military operations, our global information infrastructure, emergency response, transportation, telecommunications and a host of other commercial applications in every day life," Steiner said. "Our commitment is to ensure this capability continues to deliver this precise PNT (position, navigation and timing) across the globe."